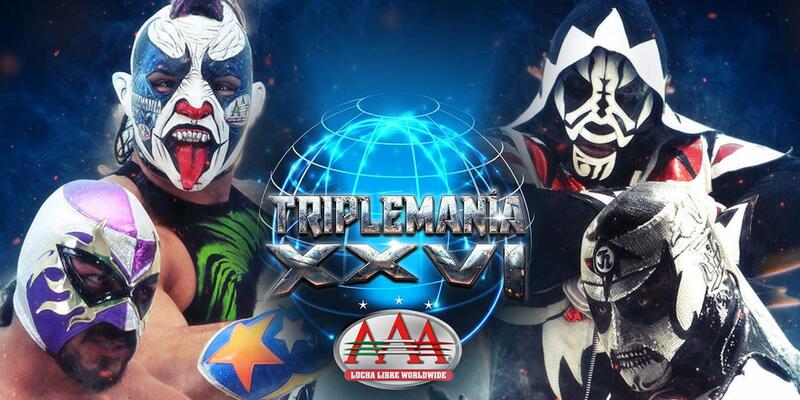 AAA presents their biggest supercard of the year with Triplemania XXVI from Arena Ciudad in Mexico City. Four aces wager their masks in proverbial high stakes poker. LA Park, El Hijo del Fantasma, Psycho Clown, and Pentagon Jr. meet in a four-way mask match inside a cage. The losing ace will lose his mask. On a show with a main event dubbed "Poker de Ases" (Poker of Aces), bets also determine other stipulations on the card. The semi-main is an anticipated apuesta match months in the making. Faby Apache puts her hair on the line against the mask of Lady Shani to settle a feud that began over six months ago. Their backstory arguably has more depth than any other match on the card. Jeff Jarrett defends the AAA Mega Heavyweight Championship for the first time since winning the title a few months ago. Jarrett faces Fenix, Brian Cage, and Rich Swann in a four-way match. Four-way matchups are themes throughout the card. A ladder match involving four teams determines the number one contenders for the promotion's tag team titles. Likewise, the AAA Mixed Tag Team Championship is on the line in a four-way tag match. Trios matches -- including a street fight and a lumberjack match -- are also on the undercard. The pre-show includes Australian Suicide defending the AAA Cruiserweight Championship in a multi-person match of some sort that likely includes ACH, Shane Strickland, and Sammy Guevera. Follow along with our live coverage beginning approximately at 7 p.m. Eastern for the pre-show. The main card begins at 9 p.m. Eastern time. The show streams live for free on Twitch with either Spanish or English commentary. Not much to the pre-show. Technically, there was a pre-show before the actual pre-show -- which mostly consisted of backstage interviews and live shots of an empty arena. Hugo Savinovich talked with AAA Mega Heavyweight Champion Jeff Jarrett in a pre-tape interview. They both put over the importance of tonight's show. Jarrett mentioned his family's deep history in the business. He vowed to leave with the Mega title. Jarrett had great things to say about Fenix -- but Jarrett says he will still beat him tonight. Jarratt said he has his trusty guitar by his side, and he also has a few tricks up his sleeve. "The King of the Mountain" is ready. Aside from the interview with Jarrett, this may be the most boring pre-show in the history of the pre-shows. Nothing but a wide camera angle for minutes upon end -- but there was at least pop music to entertain us. Bless our hearts. Business really picked up shortly after the show was set to go live on TV in Mexico. The announcers were all introduced one-by-one. Bell time was soon. Striker noted on commentary that a documentary about AAA is debuting right after this show on the live stream. Two matches took place on the pre-show. Freelance pinned Aramis in a Llave a la Gloria match. This is part of an ongoing up-and-comer series. The match was wild with lots of dives and highspots. They were going all out. There were Asai moonsaults and springboards -- along with a Spanish Fly off the apron on the floor. There was a tribute in memory of Villano III. Guevera pinned Suicide with a 630 splash to win the title. Dives from the outset led to two of the four squaring off in the ring at a time. The match was fast-paced with highspots galore. Everybody got to shine at times. Killer Kross ran in after the match to clean house. Kross offered Suicide a MAD t-shirt. Suicide accepted to become the newest member of the MAD faction. Dr. Alfonso Morales and El Apache in a ceremony were inducted into the AAA Hall of Fame. The opener for the main card was a mixed tag four-way. Hamburguesa scored the pinfall with a splash for his team to retain their titles. This was good and the crowd loved it. They had some comedy spots during the match with the closing moments getting more serious. They all traded near falls and saves. Vikingo did a Shooting Star Press to the outside early on in the match. Angelikal executed a Phoenix Splash. Big Mami cleared the ring at one point -- which really popped the crowd. Dinastia springboarded into a tornillo splash. Vikingo almost ate it -- but he recovered for a double springboard. Vanilla was press-slammed out of the ring onto a pile of bodies. Big Mami then dived off the middle rope on everybody. The parade of dives continued down the stretch. Big Mami delivered a Black Hole Slam. Hamburguesa then jumped off the top rope with a splash for the pin. Bandido climbed the ladder to grab the contract to make him and Flamita the next contenders for the tag team titles. The match was a wild spectacle and a fantastic stunt show. The first big stunt was Everett doing a springboard Frankensteiner on Laredo Kid off a ladder to the floor. Kid built a ladder bridge. Kid then broke out with a Spanish Fly on Everett off the bridge. DJZ springboarded into a twisting splash. Everett springed off the ropes into a Shooting Star Press to the outside. Kid took a sick and crazy bump off the ladder. Drago leaped into a cutter with Bandido on a ladder. Aerostar did a sunset powerbomb off the ladder. Kid and Aerostar both hung from the wire holding the contract. Bandido executed a moonsault/powerslam combo on Drago through a table. Flamita gave Aerotar a Death Valley Driver. Bandido then climbed up to unhook the contract hanging above. The MAD faction lurked to the ring for promos and a challenge. Konnan was joined by Jeff Jarrett. Teddy Hart, Australian Suicide, Killer Kross & Juventud Guerrera. They called out and taunted Vampiro -- who was on English commentary at ringside. Pagano and Murder Clown ran down to make the save -- but they got a beatdown instead. Then they just left. Vampiro was livid because his music was not playing. He cursed and yelled about playing his music. They finally played his music. Vampiro then got in the ring to confront Konnan face-to-face. The ring cleared except for the two longtime rivals. They cursed at each other and exchanged insults. Vampiro had a contract for a match with Konnan. Before Konnan signs it, a loser leaves Mexico stipulation is added. The crowd was hot for the segment. A potential match is box office. Poder del Norte reatined their titles after they all splashed Hijo de LA Park for a pinfall. While the action was good, it felt rushed. They still managed to do a lot of cool stuff. The exoticos got to shine with triple dives and such. This was one of those don't blink or you will miss something kind of matches. They tried to put ten pounds of goods into a five pound sack. Averno pinned Hart with a powerbomb after a run-in by Poder del Norte. The lumberjacks had straps to whip anyone trying to powder. They even whipped the referee. The OGTs and MAD brawled -- but they also mixed in highspots. Hart was doing creative spots as usual. Poder del Norte ran in to attack the OGTs. The dust cleared from the melee, and OGTs targeted Hart. Averno powerbomed him for the pin. Following the match, OGTs and Poder del Norte continued to brawl. A fight almost broke out with a fan as the trios left the ring. Texano pinned Lider in a brutal bloodbath. More so than a street fight -- it was a weapons-filled death match. This was beyond insane at times. Weapons used included chairs, trash cans, ladders, light tubes, tables, thumbtacks, a shopping cart, and fire. The brutality began from the start. Murder Clown was slammed through a bunch of chairs stacked close together. Pagano got powerbombed into a ladder. Lider was hit with a light tube and wore the crimson mask. There were chair shots to the head -- too many chair shots to the head. Pagano missed a moonsault and crashed into light tubes. Even more light tubes were shattered in sick fashion. Murder Clown did a flip dive to the outside. Murder Clown moments later press-slammed Texano on a table covered with thumbtacks. Pagano took an ugly bump being powerbombed into a shopping cart. Pagano was cut off when he was nailed with light tubes on an attempted dive. Escorpion and Pagano did a Spanish Fly spot off the ramp through a flaming table. Even more light tubes were shattered. Murder Clown splashed Mascara through a table. Texano doused his bull rope and lit it on fire. Texano then whipped Lider with the flaming rope to score a pinfall that finally ended the insanity. Apache lost her hair after being pinned by Shani. Fighting from underneath, Shani rallied to win despite crooked officiating and underhanded tactics from Apache and company. Taurus was the second for Apache. He interfered liberally. Hamburguesa was in the corner of Shani. He tried to make a save, but left on a stretcher. La Parka came down to replace him as the second for Shani. El Hijo de Tirantes -- a rudo -- was the referee. He cheated for Apache throughout the match. Apache ambushed Shani with a chair shot at the start. Apache layed it in with stiff shots. Shani later waffled Apache with a chair shot. Apache got color, and Shani bled through her mask. Shani several times applied submission holds. Shani got a near fall where Tirantes made a slow count. Apache delivered a shining wizard. Even with a fast count by Tirantes, Shani still kicked out at two. Tirantes blatantly broke up a crossface applied by Shani. He tried to hold Shani for a missile dropkick -- only for Tirantes to take a bump instead. Shani applied the crossface again. Taurus hit Shani in the head with a chair to break the hold. Parka jumped in to hit a tope suicida on Taurus. Another referee ran in to argue with Tirantes. He shoved down Tirantes -- and then gave him a tilt-a-whirl backbreaker. Shani used a lungblower on Apache to cover her for the pinfall. Apache at first teased leaving without shaving her head. That was a callback to the last time she lost an apuesta match. Apache eventually went back to the ring and shaved her head. Fenix pinned the defending champion -- Jarrett -- to win the title. Jarrett lost in his first and only defense of the championship. Dr. Wagner Jr. made a surprise appearance that played into the finish. Fenix ran wild at the outset -- until Jarrett twice hit Fenix with a guitar. Fenix bled heavily as Jarrett worked him over. Jarrett paused to do the Fargo strut alongside Swann and Cage. They then turned on Jarrett. Swann and Cage double-teamed Jarrett with the Hart Attack finisher. Fenix did a super Frankensteiner on Swann. Cage had Fenix in a delayed vertical suplex on the outside. Swann then took them both out with a dive through the ropes. Jarrett teased doing a dive -- but he strutted instead. A trading of near falls began. Swann got one near fall. Swann moments later received a buckle bomb by Cage for a two count. Cage at the same time slammed and powerbombed both Swann and Fenix. Jarrett rushed in to apply a figure four leglock on Cage. A wild scene unfolded in the front row when Marisela Pena threw a drink at Jarrett. Fenix then went for a dive where he accidentally wiped out Pena. Medical staff rushed towards ringside to aid Pena. Back in the ring, Jarrett hit the referee with a guitar. After Jarrett delivered a low blow, La Parka's music blared. Someone in disguise came to the ring dressed as La Parka. That is a callback to a previous angle where Jarrett won the title. The imposter Parka unmasked to reveal himself as Dr. Wagner Jr. -- who is the former Mega champion. A befuddled Jarrett was in shock. Fenix used a cutter in scoring the deciding pinfall to win the title. El Hijo del Fantasma lost his mask when LA Park pinned him in a singles match that followed a four-way cage match. There was really two matches rolled into one. Pentagon Jr. and Psycho Clown escaped the cage to save their masks in a four-way matchup. Fantasma and Park then faced off one-on-one without the cage. Much like other matches on the card, this was a wild brawl. Likewise, the entire thing was another bloodbath. Chairs, tables, and trash cans were used inside the cage. Fantasma ripped the mask of Pentagon early on. Fantasma cut his hand badly during the melee. Meanwhile, Psycho Clown superplexed Park through a table. Pentagon and Psycho Clown fought while perched atop the cage. Pentagon shot a fireball at Psycho Clown -- who fell back into the ring. Pentagon then climbed out to escape the cage. Therefore, he saved his mask. Psycho Clown was next to climb out. He got the Roman Reigns treatment from the crowd -- which is not an unusual reaction for Psycho Clown. Nonetheless, Clown escaped the cage to save his mask. From there, the cage was raised above the ring to begin the second phase of the match. El Hijo del Fantasma squared off with LA Park to decide who loses their mask. Fantasma tore off the mask of Park. While that would normally be a DQ, Tirantes was the heel ref so he let the match continue. Fantasma splashed Park through an announce table with the help of Tirantes. Park bled profusely as Fantasma worked him over. A comeback by Park led to him doing a tope suicida. Park ripped the mask of Fantasma. Park then hit him with a monitor. It shattered and Fantasma got color. They brawled into the crowd. Park hit Fantasma with various weapons. They got back into the ring to trade strikes and near falls. Tirantes was in total rudo mode. A ref bump sent Tirantes out of the ring. Park did a tope on both Tirantes and Fantasma. Back in the ring, Fantasma unmasked himself and sold like he was fouled. Two could play that game. Park also umasked himself and began selling a foul. Tirantes teased DQs, but he let the match continue. Park shoved down Tirantes. Fantasma gave Park a low blow. Park still kicked out despite a fast count. They traded more near falls down the stretch. Tirantes and Fantasma began arguing. Fantasma shoved Tirantes. Park speared Fantasma and covered him. An angry Tirantes then counted the pinfall. El Hijo del Fantasma unmasked after his father and son joined him in the ring. The night was still not over. Dr. Wagner Jr. came to the ring to cut a promo on LA Park. A challenge was made for a hair vs. mask match at next year's Triplemania. Park and Wagner cut promos on each other as the show drew to a close.